SMORGASBORD : The Morro Bay Farmers Market offers varied fare, from fresh fish to rich pastries to healthy wraps. Our local farmers markets are more attractive than ever now that they’ve expanded their offerings to include an array of good foods, both raw and cooked. It reminds me of the awesome Ferry Plaza Farmers Market in San Francisco, which attracts 25,000 shoppers weekly (it takes place three days a week.) With the Morro Bay Farmers Market held in Spencer’s parking lot, you have the added convenience of one-stop shopping. Anything you can’t buy fresh from local farmers can be found in the store. 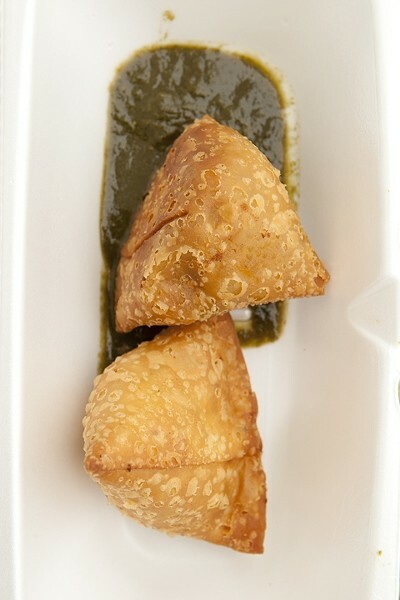 In early November, the new Cuisine Court opened in Morro Bay, and it has made both markets busier. Sales rose by 20 percent for the farmers, according to Farmers Market Administrator Peter Jankay. He’s pleased to say that as the market grows larger, it becomes more appealing to local shoppers. I appreciated it even more on a Thursday afternoon after tasting some of the delicious new treats they’re offering: roasted heirloom tomato and white bean chili, Indian curries, farmstead cheese, and freshly squeezed pomegranate juice. The Morro Bay market takes place just before the popular Thursday night farmers market in downtown SLO. My visit made me wonder why the daytime farmers markets had so few artisan products available until now. Jankay explained that the SLO Downtown Association, which manages the Thursday night market, allows food vendors, Higuera Street merchants, and community displays, along with entertainment. Jankay said the Farmers Market Association didn’t suddenly decide to start bringing in cooked foods all at once; it happened gradually. 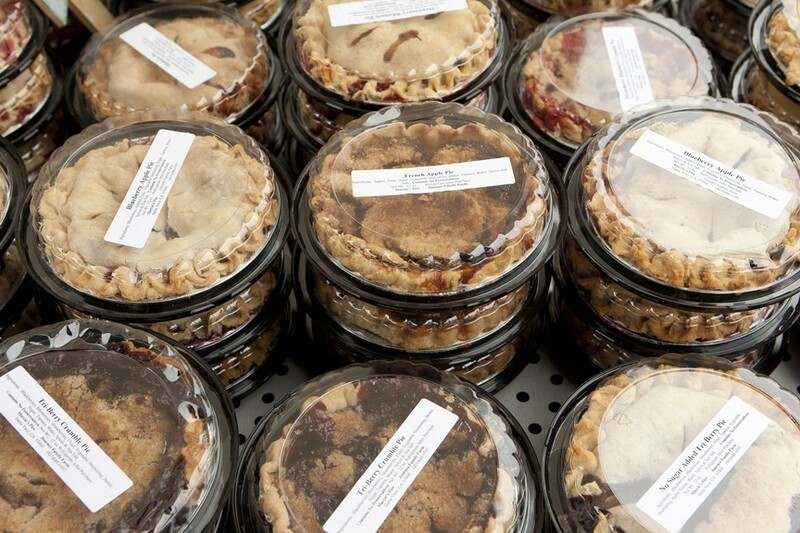 It’s obvious that we locals love it: More of us are traveling to the markets across the county because we want specialty foods and products like freshly made fruit pies that aren’t sold in our neighborhood farmers market. As I commented last week, Stephanie’s Soups were impressive. She was quite busy pouring samples and filling bottles carried there by her regular customers so they can take hot soup home for dinner. Walking along the aisle of farm stands, you can’t miss Brandie of Be Love Café pushing a Spencer’s cart overflowing with bundles of fresh kale, beets, green onions, and other seasonal produce. She buys locally farmed products almost exclusively. Some ingredients come from other places. For instance, she buys roots from a farm in Hawaii. But she quickly pointed out that if she has to buy ingredients outside of our local markets, she only buys from certified organic farms. Be Love Café, which you can visit in Baywood Park, offers many handmade specialties: vegan wraps, granola, flax crackers, nut cheese (non-dairy), and special green and red juices. Their website promotes their products as raw live foods with the explanation: “They eliminate unhealthy stresses and habits, and provide ample nutrition for rebuilding and detoxification. The healing it provides makes you resistant to disease and degeneration.” I also met Brandie’s business partner, Rachel Axtell. She prepares the fresh juices and sells their healthy foods at the farmers markets in Templeton and Morro Bay. The Be Love Café “wrap” is a collard green leaf filled with walnut pate, avocado, carrots, cabbage, heirloom tomatoes; and a sauce of orange juice, lemon juice, mustard seed, and ginger; and it’s topped with micro greens and hemp seeds. There are many participants in the cuisine court, and most provide a taste sample. Among them: George Badasci, who sells fresh pomegranate juice and the whole fruits grown in a 26-year-old grove his father planted in Hanford; Marcie’s Pies from Jimenez Family Farm in Santa Ynez Valley, where Marcie and her husband Gustavo Jimenez organically grow the fruit that goes into her delicious pies with a hand-rolled crust. They also offer meats, pork, lamb, goat, rabbit, and chicken, all of which they raise on their farm. 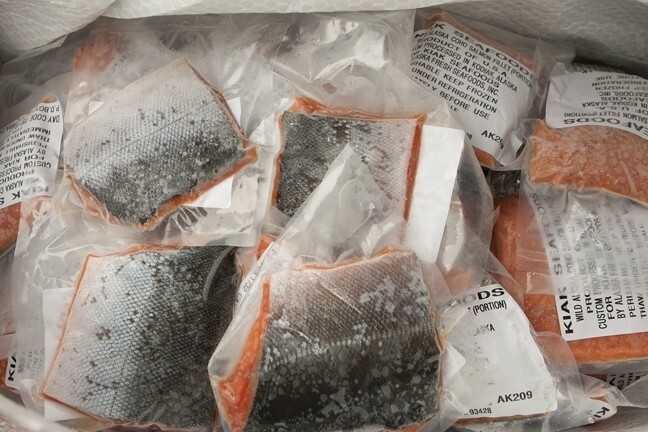 Kodiak Island Salmon, owned by John and Barbara Pierszalowski, are caught in Alaska annually, from June through August. Immediately placed in chilled water, the fish are flash frozen as soon as they hit land. This year, they brought back 3,000 pounds of salmon they describe as “better than fresh.” And Organic Pastures Dairy offers raw milk that’s safe for people who are lactose intolerant.